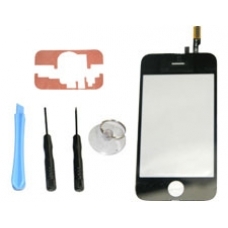 iPhone 3GS touch screen repair kit this is a complete kit allowing you to replace your iPhone 3GS touch screen with ease we have included a full tool kit and a pair of adhesive touch screen mounts. If you have damaged the front glass on your iPhone 3GS and it has cracked, or if the touchscreen is not responding to any screen touches, this will solve your problems. Please note our original iPhone 3GS screen part even has the fingerprint-resistant oleophobic coating which is applied to the original 3GS screens, other third party and lower quality 3GS touch screens do not have this specialist coating applied. * Suitable for the iPhone 3GS 8GB, iPhone 3GS 16GB and the iPhone 3GS 32GB. * Full Installation Tool Kit Included. * Includes Adhesive Touch Screen Mounts.